The following story is shared by Campbell's mom, Joanna. Campbell Labonte is an amazing little boy, not just because he is my son, but because he is full of love, life and energy. 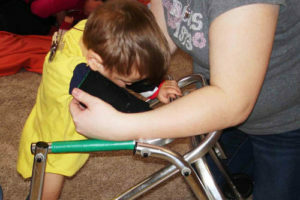 He does not let his deaf blindness, nor his cerebral palsy slow him down. 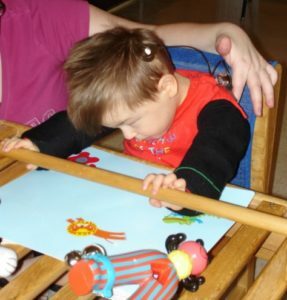 In fact, he recently completed a ten week conductive education therapy session in Picton, Ontario. At this camp, aptly named, Ability Camp, Campbell learned how to sit properly in a chair and practice standing and walking. He learned self feeding and even learned how to use the potty! These were all skills that I feared because I never really understood how to introduce Campbell to these tasks. At the camp we simply did it. Campbell took part in repetitive exercises which involved routine and familiarization. These techniques are what helped Campbell learn the skills. He and his parents alike made some wonderful new friends and we know the overall benefits Campbell gained from the camp far surpass his core strength gains. He has also gained a confidence and an understanding that he can achieve a great deal with effort, repetition and consistency. I would like to thank Sensity for their funding assistance to help Campbell attend Ability Camp. The contribution made by Sensity is so appreciated and we thank you from the bottom of our hearts.